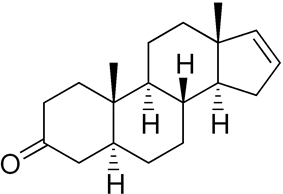 Androstenone (5α-androst-16-en-3-one) is a steroid found in both male and female sweat and urine. It is also found in boar's saliva, and in celery cytoplasm. Androstenone was the first mammalian pheromone to be identified. It is found in high concentrations in the saliva of male pigs, and, when ihhaled by a female pig that is in heat, results in the female assuming the mating stance. Androstenone is the active ingredient in 'Boarmate', a commercial product made by DuPont sold to pig farmers to test sows for timing of artificial insemination. Androstenone is synthesized from androstadienone by 5α-reductase, and can be converted into 3α-androstenol or 3β-androstenol by 3-ketosteroid reductase. Depending upon the subject, it is reported to be an unpleasant, sweaty, urinous smell, a woody smell, or even a pleasant floral smell. In small amounts, the odor is hardly detectable by most people. This may be due to a polymorphism in the receptor gene that codes for the androstenone receptor. However, the ability to detect the odor varies greatly. It has been shown that the odor can be detected by people down to levels of 0.2 parts per billion to 0.2 parts in 100 million. Several groups report, however, that some individuals who initially cannot smell androstenone can learn to smell it by repeated exposures to it. In humans, androstenone also has been suggested to be a vomeronasal organ is an auxiliary olfactory sense organ responsible for the detection of pheromones as more than just an odor. Most adult humans possess something resembling this organ, but there is no active function. Humans lack the sensory cells that exist in other mammals needed to detect pheromones beyond a smell. Humans also lack the genetic ability to produce these sensory cells actively. There is also a specific anosmia to the odor in some humans; they are unable to smell specific odors, but have, otherwise, a normal sense of smell. However, this should, by no means, be regarded as indicative for being labeled as a pheromone, as it is true of over 80 olfactory compounds. To animals, the smell of androstenone can act as a social sign of dominance, or it can be a way of attracting a mate. This smell, to some animals, has a huge impact on behavioral patterns in the specimen. 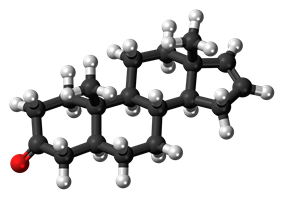 Some commercially available products are advertised using claims that they contain human sexual pheromones, including androstenone, and that they can act as an aphrodisiac. These products are the subject of marketing by mass unsolicited e-mail and typically contain deceitful claims. ^ Pierce, J. D. , J.; Cohen, A. B.; Ulrich, P. M. (2004). "Responsivity to Two Odorants, Androstenone and Amyl Acetate, and the Affective Impact of Odors on Interpersonal Relationships". Journal of Comparative Psychology 118 (1): 14–19. ^ Dorries, K. M.; Adkins-Regan, E.; Halpern, B. P. (1997). "Sensitivity and Behavioral Responses to the Pheromone Androstenone Are Not Mediated by the Vomeronasal Organ in Domestic Pigs". Brain, Behavior and Evolution 49: 53. ^ Wysocki, C. J.; Dorries, K. M.; Beauchamp, G. K. (1989). "Ability to perceive androstenone can be acquired by ostensibly anosmic people". Proceedings of the National Academy of Sciences of the United States of America 86 (20): 7976–7978. ^ a b Wysocki, C. J.; Beauchamp, G. K. (1984). "Ability to smell androstenone is genetically determined". Proceedings of the National Academy of Sciences of the United States of America 81 (15): 4899–4902. ^ Bonneau, M.; Walstra, P.; Claudi-Magnussen, C.; Kempster, A. J.; Tornberg, E.; Fischer, K.; Diestre, A.; Siret, F.; Chevillon, P.; Claus, R.; Dijksterhuis, G.; Punter, P.; Matthews, K. R.; Agerhem, H.; Béague, M. P.; Oliver, M. A.; Gispert, M.; Weiler, U.; Von Seth, G.; Leask, H.; Font i Furnols, M.; Homer, D. B.; Cook, G. L. (2000). "An international study on the importance of androstenone and skatole for boar taint: IV. Simulation studies on consumer dissatisfaction with entire male pork and the effect of sorting carcasses on the slaughter line, main conclusions and recommendations". Meat science 54 (3): 285–295. ^ "Sniffers' genes dictate if sweat smells sweet". New Scientist. 2007-09-22. Retrieved 2007-09-25. ^ Steenhuysen, Julie (2007-09-16). "Stinky? It's not his sweat, it's your nose". Chicago. Reuters. Retrieved 2007-09-25. ^ Swaminathan, Nikhil (2007-09-18). "The Scent of a Man". Scientific American. Retrieved 2007-09-25. ^ Lundstrom, J. N.; Seven, S.; Olsson, M. J.; Schaal, B.; Hummel, T. (2006). "Olfactory Event-Related Potentials Reflect Individual Differences in Odor Valence Perception". Chemical Senses 31 (8): 705–711. ^ Birchall, Annabelle (1990-08-25). "A whiff of happiness: Can smelling a molecule contained in human sweat ease anxiety and stress? Some scientists think so, and argue that 'osmotherapy' may also help people to slim or stop smoking". New Scientist. Retrieved 2007-09-25. ^ Graham, Sarah (2002-10-23). "Nostrils Share Information for Recognizing Scents". Scientific American. Retrieved 2007-09-25. ^ Kirk-Smith, M.D., and Booth, D.A. (1980) "Effect of androstenone on choice of location in others' presence". In H. van der Starre (Ed. ), Olfaction and Taste VII, London: Information Retrieval Ltd., pp.397-400. ^ Araneda, R. C.; Firestein, S. (2003). "The scents of androstenone in humans". The Journal of Physiology 554 (Pt 1): 1.